What if you could pay for just the minutes, text messages and data you use? And, what if you were credited back in cash any minutes, text messages and data you didn’t use? That’s what the new carrier Zact is promising when it goes live early next month. You set a monthly budget for your cellphone service and then allocate dollars to talk minutes, text messages and data. You can play around with creating your own plan with Zact’s Saving Calculator. Don’t text? You can choose zero text messages—or zero for data or talk minutes for that matter. And if you just need data for an app or two, there’s not need to buy a bucket of data. You can purchase all-you-can eat access per app—for checking email or accessing Facebook, for instance. The best part is that unlike pre-paid or pay-as-you-go plans, you get the same types of rates as you would with most contract services. If you overestimate your usage, you get a credit back in cash at the end of the month that’s applied to your next bill. If you run out of minutes, messages or data, you’ll be prompted to buy more, or you can rejigger your allotments to cover the difference. So, if you over estimated your talk minutes and underestimated text messages, you could decrease your talk minutes on the fly to give yourself more text and not increase your bill. For minutes, you’re given a warning when you’re down to your last 5 minutes. And if you’re on a call, you even purchase more minutes without dropping your call. Every plan can be shared between multiple devices and mobile hotspot is included. So one family could share a bucket of talk, text and data. Every device can be allocated its own amount of minutes, text and data. So you don’t have to worry about your tween burning through your text messaging. You tween’s devices can also be set up as child devices with no control over changing the talk, text or data allocation. As a regular device, not an administrative device, parents have granular control over when the phone can be used, who the phone can be used to communicate with and which apps can be used. So, your child could always call you, but only communicate with friends after school. Or you child could only play games after dinner, but access email and the Internet after school. And, if you need to take away access at any time, there’s a handy “curfew now” button you can press on any phone with an administrative account that shuts everything down except communication with designated people and emergency services. So what’s the catch? For now, you’ll have to buy a new device and there are only two choices—the LG Optimus Elite (pre-order for $199 on zact.com) or the LG Viper 4G LTE (pre-order for $399 on zact.com). They’re both good phones, but they came out about a year ago and don’t have the latest hardware or run the most recent version of Android (The Elite runs Android 2.3 Gingerbread and Viper runs Android 4. 0 Ice Cream Sandwich). Also, Zact runs on Sprint’s network, so the LTE network that the Viper runs on will be patchy for now. 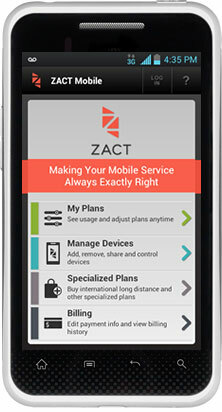 For those that want to dip their toe into the smartphone waters, Zact provides a safe and simple way to ease yourself and your family in without the worry of spending too much per month. For those that are looking for the latest high-end devices, It’s On, the company behind Zact, promises them soon. It’s On is also working on bringing this same type of plan control to other carriers—something we can all hope comes sooner rather than later.